Santiago Calatrava is one architect who seems to breathe and ooze controversy with everything he designs. A structural engineer as well, he has been criticized of designing projects that are almost impossible to build leading to cost overruns and technical flaws. However, for this particular project, Florida Polytechnic University, he seemed to put a stamp on his master-class and show the critics that he won’t overhaul his signature designs, yet again, won’t feed the critics with more meat on which to maul and disassemble his big name. The project cost a whopping $60 million despite its planned $45 million. 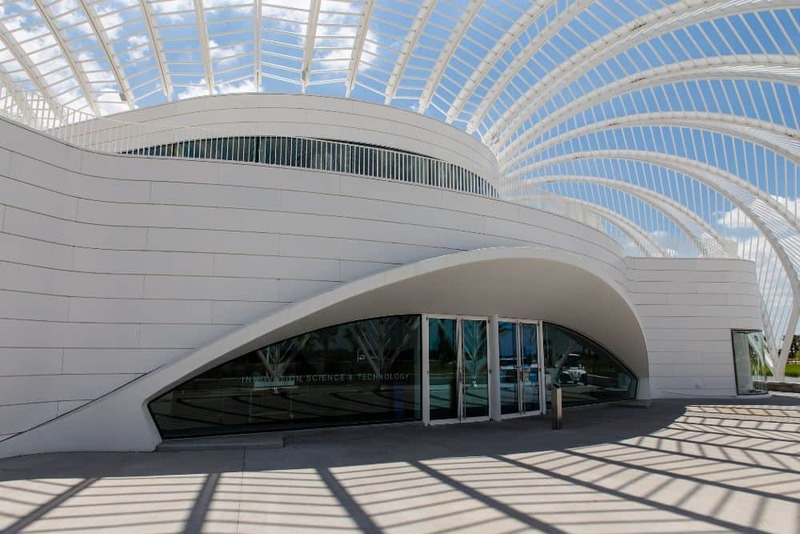 The university is keen to defend Calatrava on the budget insisting that measures had to be put in place and the building actually met the most recent budget. However, for those of us who are not so forgetful of Calatrava’s doings $60 million is a drop in the ocean when you consider the World Trade Centre Hub which is now projected to double its estimated cost to $4 billion. One thing that must be certain is that right now as the project was completed, deep in their hearts the critics of this Innovation, Science and Technology building in Florida must be feeling proud, knowing not to critic too much this spaceship-likened piece of architecture that sits in a land that used to be occupied by cows, and a large water feature. In an interview with the Tampa Bay Times, Santiago Calatrava says that he admired Frank Lloyd Wright’s magical ways of understanding the organic and improving a place. A true testament to how much he was inspired to change this place. Florida Polytechnic University needed a new campus and despite knowing how controversial Calatrava’s designs are, they dared to appoint him to do the master-plan and kick-start the whole development with this building as the first. What Calatrava came up with was a budget-sensitive building knowing that an institution could only tolerate unnecessary increments in budgets for so long. However, despite being conscious of the budget, the building is still aplenty of Santiago’s famous design elements including lyrical curves, sweeping repetitive lines, biomorphic forms and technological innovations integrated seamlessly into the art forms. Having studied in a Polytechnic in Valencia, Spain, Calatrava was inspired to bring to students a design that would probably be fitting of some of the best universities around the world. The building was designed as an elliptical form surrounded by metallic arches in the form of pergolas which shade the second-floor terrace. Labs and classrooms are accommodated in the first floor. In the second floor, there is a large common area surrounded by faculty offices. Outside the building on the second floor, a large terrace was designed, about 20 ft wide and equipped with outdoor furniture and plants. The building is very energy-efficient courtesy of a domed glass ceiling in the multipurpose common area. The domed glass ceiling has louvred panels which open and close depending on the time and day, and intensity of sunlight to sunshade the building as well as keep it lit. The panels are also coated with solar films to collect energy that is used for some small lighting functions in the building. It was Calatrava’s dream that students and lecturers would use the terrace for lectures exposing them to amazing views across the campus and beyond the lake. True to his belief in public bridges, he designed a series of pools that descend towards the building and can be accessed by six pedestrian bridges lined across them on either edge of the water. The interior of the building is Santiago’s dealings with light as one of the elements of design. The pergolas cast a lot of shadows on the terrace creating undulating impressions of how light effects on the materials. However, the lighting impressions don’t just stop outside, they continue into the common area through the louvres above the building. The effect is that different kinds of shadows are created inside the building filling it with a lot of activity. A large amphitheatre was also designed for public functions bringing to a climax the design of this two-storey building clad in white grating. Santiago Calatrava may be subject to a lot of criticism and media bullying but his resolve for continued technological and architectural advancement is relentless. 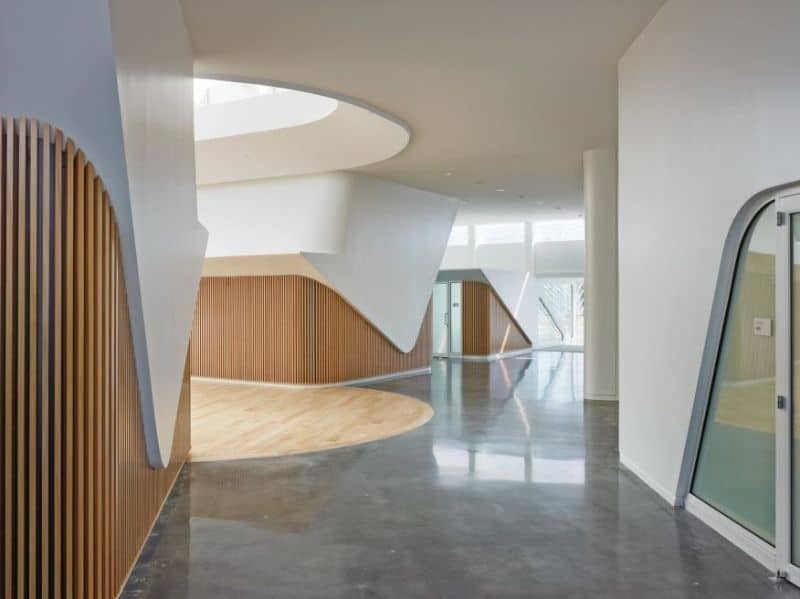 His fees may be high as witnessed by the $13 million his firm got out of this project, and sometimes the budget might exceed expectations, but in this campus we finally see the Santiago that came to fame in the 1990s with his Milwaukee Art Museum alongside Lake Michigan.